With more than 22 years experience in the property business both in th UK and Spain we are totally aware of how big a step buying a homeis, especially somewhere like Spain. The general rule is ITP @ 10%. In Summary, allow for up to 13-14% of the purchase price in taxes and other costs. N.B. If the buyer takes out a mortgage these costs can be somewhat higher due to an additional public deed for the mortgage and the inevitable bank charges involved. In this case transaction costs might reach between 15% and 16% of the value of the property purchased. This tax is to be paid by the seller. Spanish property sold by a non-resident owner will be charged capital gains tax at 24.75%, with a 3% withholding provision which is retained at notary appointment, this is then decuded from the 24.75%. 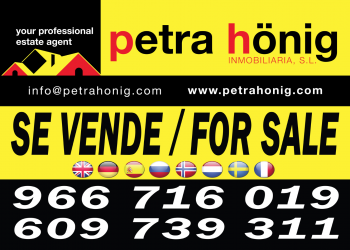 Finally you will complete the purchase of your Spanish property. This is the day you will receive the keys and can start enjoying your new home. Even after purchase, whether you need pool or garden maintenance, small or large building work, we are here to help. If you are actively looking for property and would like to be regularly updated with information about the best property available why not register on our mailing list and be the first to see, what could be your next home or investment.